We are RE-OPENING on September 8th! After a long summer of being closed to the public due to the heat in the Greenhouse, we are now re-opening with the fall semester. What can the Greenhouse do for you? 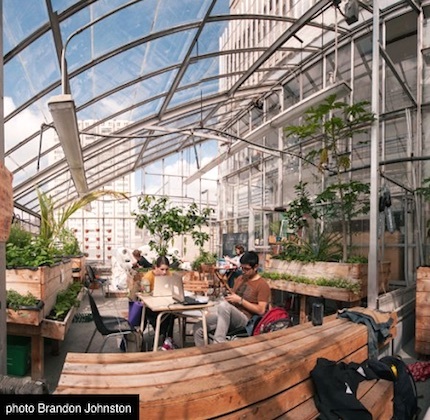 There are lots of ways to benefit from the Concordia Greenhouse! Come use our lounge and kitchen, open Monday – Friday, 11am – 5pm. It`s a great, warm and sunny space filled with plants, educational demonstration systems and knowledgeable staff, available to answer your questions! Attend one of our educational workshops. This September we are offering some great events, such as Soap Making, Sacred Garden Design, Extending the Growing Season, Creative Writing, Food Preservation, Seed Saving and Permaculture. Buy our delicious produce, sold at the Concordia Farmer`s Market, Frigo Vert and the City Farm School Market Stand. Pick up a cute plant at our Fall Plant Sale! We only sell house plants at three times of the year – September, January and May. Get great tips and ideas on container gardening with our Demonstration Balcony Garden project! Check out the demo in our atrium lounge, or read our on-line resource on Montreal-specific gardening. What can you do for the Greenhouse? Join our Volunteer Sessions on Mondays and Tuesdays, and get your hands dirty helping out with our Four Seasons Growing program or with our House Plant propagation program! Meet other friendly plant enthusiasts, and get great experience for your resume! Join our Board of Directors. We are looking for new board members to start this November! More details to come. Previous PostGreenhouse Cleaning PartyNext PostFall Plant Sale at the Concordia Greenhouse!